Some of this week's Letters to AutoSpeed. I recently bought an old Saab because it looked really comfortable. However, it turns out that it is surprisingly quick for a big old lump - it's a 9000 Carlsson 2.3 turbo. 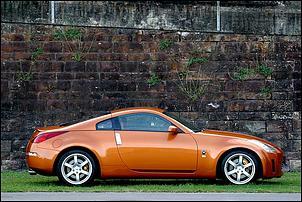 Do you know of a website or somewhere I can find out about comparative speeds/performance of cars? I'd like to know what I can and can't beat! At the age of 51 I feel more like 21 when I'm driving it! Thanks for any help you can give me. Good score! The 2.3-litre version of the 9000 Carlsson makes 162kW at 5200 rpm with 334Nm at 3000 rpm in manual form (with the standard 1.0 bar of boost), or 147kW at 5000 rpm with 300Nm at 2000 rpm in auto form - either way, these beasts offer a great spread of useable performance. According to original Saab brochures, the manual could accelerate to 100 km/h in just 7.9 and the auto a still respectable 8.5 seconds. With good response and strong torque it's safe to say the only vehicles that will beat you are very much performance oriented - you'll know these cars when they pull up next to you! 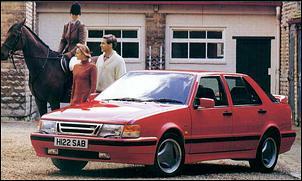 Check out sites such as http://www.saab9000.com for more info. Your site is pretty good. Just one gripe from a Europhile trainspotter - Series 2/3 2.0-litre Peugeot 405 Mi16s had 116kW, not the 108kW listed at "Sub-10k Supercars - Part Two". Plus, the 405 Mi16 is a nicer drive than the 205 GTi as it has a better equipped interior and better NVH. Cheers. Hey - fantastic 350Z twin viewpoint review ("New Car Test - Nissan 350Z Track") plus the Driving Emotion column ("Driving Emotion") - real interesting. I hope there's more to come like that - it freshens up the articles. Not the Cut and Paste! Regarding "Driving Emotion" dated 20th July, 2003. Bravo, Julian, on a story that tells us - in my opinion - what we all need to hear. We are always being bombarded with information that is usually some kind of sales pitch from a car manufacturer - sometimes it even seems that journalists simply 'cut and paste' these spiels into their articles. I feel that the driving philosophy that you have described is most important and, yes, I wholeheartedly agree that a motor vehicle should be able to perform properly and comfortably on real roads not just test tracks. Hi again everyone - here's Powercruise update Number 3. You can now find the Powercruise Guide at www.powercruise.net This guide tells you everything you need to know about where to park, where to go if you're an entrant or a camper and everything that the scrutineers will be looking for. Note that there will also be a police presence at Powercruise and I have explained what their role will be as well. You will also find details on two of the main Powercruise events - the Carline Mufflers Powercruise itself and the Burnout competition. Both have been explained in detail. Chris Hollingworth is bringing his 1500hp blown Holden Commodore ute to Powercruise and tells me he will be pretty well invincible in the street drags... so I have set up a challenger for him in the way of Theo Woollett from Brisbane. Theo runs a 10-second Skyline and says, if he can keep the engine off the rev limiter, he won't have any trouble hosing the Commodore ute over the 1/8th mile. More event details will be released in the near future so keep an eye on our website updates. The gates will open on Friday the 31st of October at about 3pm. Note that Powercruise will only be accepting registered cars as entrants in the events. Some invited display cars will not have to be registered and they won't be eligible to enter any events for prizes/prize money; these types of cars will be by invitation only, so DON'T show up in your unregistered burnout or drag car and expect to be allowed into the event! I'm looking to move somewhere that the cars are good, the laws are loose and the roads are fun. Can you help me out? I am an enthusiast and would like to move to Cali, but I've heard the CARB emissions rules are pretty harsh. Could you help me pick whether I should move or not? Where is a great place for a motorsport enthusiast? Any info is greatly appreciated. I'd just like to tell you guys you have a good thing going. I did notice that maybe you should consider having another article that hasn't been touched before. 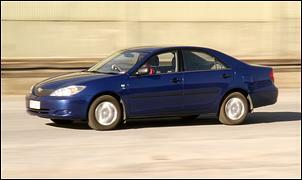 What sets the difference between a $26,000 new Camry and say a $60,000 ES300? Some would say the more sophisticated interior, leather, engine smoothness, quieter ride and greater sophistication; debatable. One thing that is very different is the amount of sound deadeners employed in lower range cars and higher range cars. Although most of us car buffs know the difference sound deadening makes, most of us also fail to employ more sound deadeners to make our cheaper ride feel more expensive. Perhaps this is because the normal 'brown bread' substance used by stereo buffs cost so much!! I'm sure that there are other alternatives to deadening sound - maybe melting some rubbery substance on the metal, firewall, 3/4 panels and floor? I know the essence is making the rubbery material stick to the metal and have the fullest contact to get rid of any vibrations. What substance cancels vibration the most? Hmmm... some research. Anyway, this is just an idea for you guys to contemplate; maybe get Julian to deaden the sound on his Maxima. 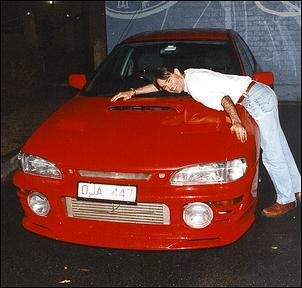 Get a mate to sit inside and guess what sort of car they're sitting in - maybe add some leather perfume as well to get that German car smell going as well! Sound deadening is a topic we have on our 'to do' list. Do any readers have some personal advice/experience to offer?